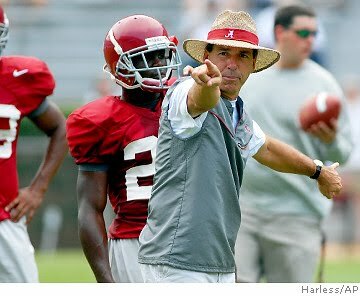 Coach Nick Saban has been nominated for the Liberty Mutual Coach of the Year. This is a completely fan poll online, so let's make sure he wins!!! Fans can vote no more that one time a day at http://www.coachoftheyear.com/. The winner of the award wins $50,000 for his favorite charity and the school of the winning coach recieves a $20,000 donation for their Alumni Association to fund scholarships. So get to the polls Tide Fans!!! !